The gorilla, one of the four great apes, is the planet's largest primate. They are found in the cloud and rain forests of Central Africa. Biologists recognize two species, the eastern gorilla and the western gorilla, each of which has two subspecies. All gorilla species are listed as endangered by the International Union for the Conservation of Nature. Poaching, habitat destruction, climate change and infectious diseases, like the Ebola virus, threaten the gorilla's survival. 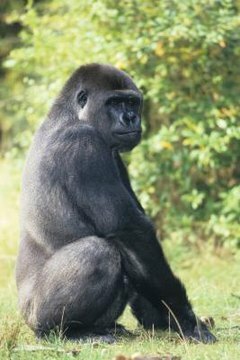 The western lowland gorilla and the Cross River gorilla, the two western gorilla subspecies, inhabit tropical rain forests in Cameroon, the Republic of the Congo, Gabon and Equatorial Guinea. They also occur in a small portion of Nigeria and the westernmost tip of the Democratic Republic of the Congo. Eastern gorillas, which include the eastern lowland gorilla and the mountain gorilla, can be found along the eastern border of the Democratic Republic of the Congo. Their range also includes parts of Uganda, Rwanda and Burundi. The lowland subspecies lives in rain forests, while the mountain subspecies prefers higher elevation cloud forests. Male gorillas typically weigh between 300 and 400 pounds; females have an average weight of 200 pounds. Males may be up to 5 1/2 feet tall when standing on two feet. Females are usually no taller than 5 feet. The eastern lowland subspecies is the largest. Western gorillas and eastern lowland gorillas have soft, short hair suitable for the rain forest. The mountain gorilla's hair is longer and thicker because it lives in cooler cloud forests. The western gorilla's coat is brownish-gray, while the eastern gorilla's hair is closer to black. Older males develop white hair, which has earned them the nickname "silverbacks." Like all the great apes, the arms of the gorilla are longer than its legs. Though they can stand upright, they usually use their arms as legs, a characteristic known as knuckle walking. Gorillas are herbivorous. Their diet consists of vines, leaves, stems, shoots and roots. Western lowland gorillas also eat fruit. Occasionally gorillas will ingest invertebrates living among the plants they consume. An adult male gorilla may eat up to 45 pounds of vegetation a day. Gorillas are ground-dwellers and, like many primates, are social. They live in groups that typically include several females and their young and are led by a silverback. Because they are responsible for the safety of their family group, when threatened, silverbacks may show aggression by beating their chests and charging. They are otherwise surprisingly shy. Gorillas use leaves and branches to create nests on which to sleep.